When considering the "Bilingual" aspect of JBBP, Japanese language instruction is implicitly expected. The "Bicultural" side of JBBP encompasses both daily activities and special events & activities that set JBBP apart. Literally translated as "Radio Calisthenics", all of the Rosa Parks Elementary student body start the school day by light stretching and exercises. This follows a tradition set more than 60 years ago in Japan. 3 days a week the whole school participates in morning exercises in Japanese. Honoring Elders Day. Students K-5 write letters to elders in their family. Otsukimi is a seasonal festival to enjoy the moon on the night of August 15th, on the old calendar. In Japan, people decorate with silver grasses and offer rice dumplings to the moon. K-5 celebrate Otsukimi in classroom. Sports Day In September students participate in a field day with activities like running races, tug of war, ball toss. Take the day off of work and cheer the red and white teams! Japanese Speech Competition. Students in 2nd through 5th grade present speeches in Japanese each fall. Culture Day, which falls on November 3rd, is a national holiday when people are encouraged to love freedom and peace and to promote culture. Many cultural events are held throughout Japan during the period around Culture Day. Art, film, drama, broadcasting, and music festivals take place at this time. Many schools also have culture festivals where students use cultural activities to display what they have done. We invite Japanese culture groups Kagamikai (Taiko Group) Tuzumi or Kyogen in school. Children pledging allegiance to the American flag at San Francisco’s Raphael Weill Elementary School (now rosa parks elementary) in 1942. Those whose families were of Japanese ancestry were sent to internment camps. Performing Arts Showcase. All students K- 5th perform songs, dances and skits on an evening in December. New Year’s Celebration. Students do new year’s activities like eating mochi, inari sushi and ozoni soup, and playing karuta, sugoroku, fukuwarai, otedama, ohajiki, kendama and koma. Hinamatsuri is also called the Doll’s Festival. It is celebrated on March 3rd to wish girls good health and growth. Most families that have girls celebrate by displaying a set of beautifully dressed dolls that represent the members of the ancient imperial court of the Heian Period (794 to 1185). The Doll’s Festival is also called momo-no-sekku, which means the Peach Festival, as it is celebrated in the season when the peach blossoms bloom beautifully. We decorate Hina Dolls and celebrate with hina-arare and Sakura moch. Cherry Blossom Festival & Parade. Each April we sell our famous Sakura Popcorn at the Cherry Blossom Festival and march in the parade. 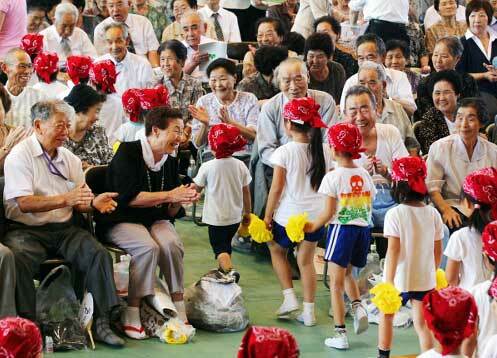 Families display carp banners (koi-nobori 鯉のぼり) or helmet (boshi 兜). We eat sweets called Kashiwamochi to celebrate the special Day. Carp banners 鯉のぼり and helmets 兜 are famous symbols used to celebrate Children’s Day in hopes that our children will grow up with courage and wisdom. We decorate helmets (boshi 兜) and eat Kashiwamochi in classroom.